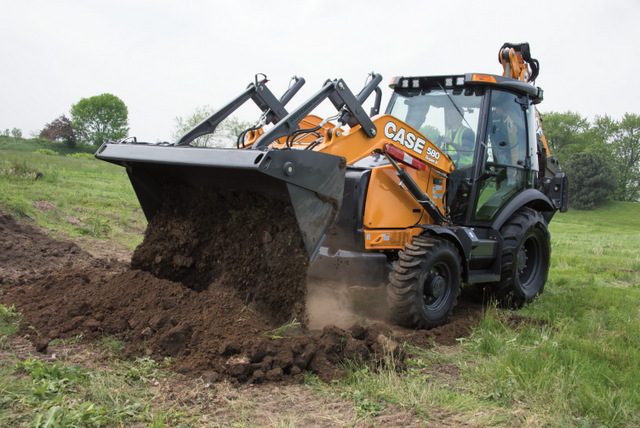 PowerBoost (Industry Exclusive): A new button on the left-hand backhoe joystick provides the operator with a momentary boost of increased hydraulic power without decreasing engine RPM (so as not to affect speed/cycle times). This feature is ideal for digging through tough conditions, including hard clay, rock and frost. 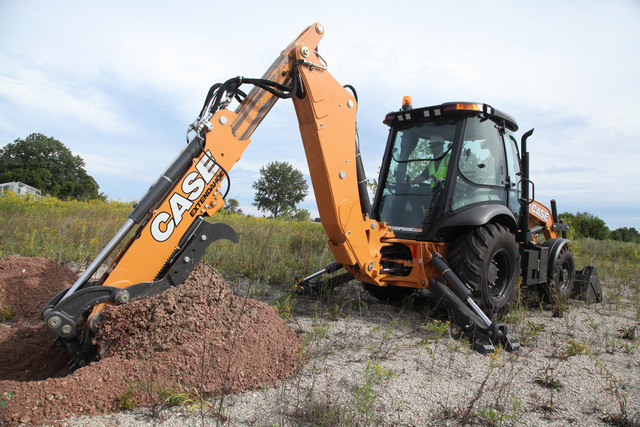 CASE backhoes still feature PowerLift, which provides added lifting power (comparable with some mid-sized excavators) at lower engine RPM to provide powerful and smooth lifting and craning operations. PowerDrive Upgrades: A new feature on CASE S-Type and H-Type transmissions, Direct Drive, engages the engine and transmission directly for improved gradeability, faster roading speeds, improved fuel economy, and faster travel times around the jobsite and between jobs. The PowerDrive transmission maintains the existing autoshift feature as today and now includes an automated activation of the direct drive feature in third and fourth gears based on torque demand and conditions on the jobsite. New Factory-Installed Hydraulic Thumb: Available on all extendahoe models, this new factory-installed hydraulic thumb improves material handling performance and is also compatible with either a mechanical or hydraulic bucket coupler, allowing the owner to change buckets/attachments without affecting the thumb installation. All new extendahoe models include the new thumb mounting provision, providing the customer the ability to add on the new thumb after the time of purchase without requiring any welding on the structure. New Loader Control Functions: The loader joystick features three new switches that will simplify operation and make it more intuitive: A new declutch trigger on the back of the joystick allows for simple operation while performing continuous/repetitive operations, such as loading trucks, etc. ; a new roller/rocker switch with a detent position that can be locked in the forward position for use with attachments such as brooms and snow blowers; and a new F-N-R switch that allows for quick and easy directional changes without ever taking a hand off the joystick. New Backhoe Control Roller Switches: Newly enhanced roller switches for auxiliary and extendahoe control have been added to the backhoe pilot control joysticks for intuitive control and improved metering. New Cab Amenities: CASE has improved the seat design with new cushioning on its air-ride seats, and a new premium heated, air suspension seat option with multi-colored, hand-stitched fabric. A hands-free, Bluetooth radio has also been added for allowing operators to safely take their phone calls, while also providing the ability to stream a broader spectrum of music, including SiriusXM and music from personal mobile devices. New Electronic Fuel Priming System: Standard on all 580N and larger backhoes, this new system is easily accessible at ground level and evacuates all of the air out of the fuel lines for a simpler and more efficient service of the fuel filters. Horsepower on the 580SN Wide Track model has increased to 110 horsepower for improved acceleration and gradeability (especially when paired with the new Direct Drive). For more information on CASE, click this link. Really, what else are you doing?